The X-Men agree and devise a plan to have Storm and Binary lure the Brood away from their homeworld while the rest of the X-Men teleport down and free the Acanti soul. Wolverine worries that the eggs inside the X-Men could hatch at any time, but is unable to kill them to prevent it. The X-Men launch their attack, and while the majority of the Brood fleet takes the bait, an embryo within one of the X-Men telepathically alerts the Brood Queen to the X-Men's true intent. As the X-Men fight their way towards the soul, Wolverine notes that Cyclops is acting more hostile towards him than usual, and Kitty gets separated from the team. In space, Storm and Binary are about to be overwhelmed when the Starjammers, having spent the last few weeks searching for the X-Men, drop out of warp. 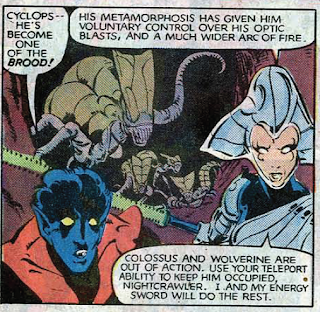 Back on Broodworld, Wolverine realizes Cyclops has begun transforming into a Brood, and when the Queen and her warriors arrive, the X-Men are easily overpowered. Elsewhere, Kitty is saved from a squad of Brood by a small purple dragon before reaching the Acanti soul. When Cyclops' consciousness surfaces for a moment, Wolverine takes advantage of his struggle to free himself and take the Queen hostage, forcing the Brood to release the rest of the X-Men. They reach the Acanti soul just as Kitty emerges. The X-Men enter the soul, but the Queen and the embryos inside the X-Men begin corrupting it, triggering the X-Men's transformations. Wolverine moves to kill the X-Men but is stopped by Binary, who uses her power to give the soul enough energy to overcome the Brood's corruption and free itself. In the process, it destroys the embryos inside the X-Men and turns the Brood Queen to crystal. Moments later, the X-Men are teleported aboard the Starjammer just as Broodworld, disrupted by the flight of the soul, explodes. Storm rejoins the team, her body fully healed, and the X-Men celebrate their victory, but Wolverine tells them that before the Brood Queen died, she boasted that a remaining Brood egg threatened Earth itself. He figures there's only one person who could be hosting it: Charles Xavier. Though he goes unnamed, this is the first appearance of Lockheed, Kitty's pet dragon. A divisive character amongst fans, many feel he is the final nail in the coffin of "Kitty as a normal girl", and it is ridiculously twee that a character as Mary Sueish as Kitty has a pet dragon. But fans who grew up with the character (like myself) tend to be more forgiving. Personally, I find Lockheed kind of charmingly adorable, one of those "only in comics" kind of things, even while recognizing the idea of Kitty having a pet dragon is patently ridiculous and problematic. It's revealed that Professor X is also carrying a Brood egg, which explains the cause of his coma during issues #157-161. As you can likely tell from the plot, this is a double-sized issue. Once again, I urge you to read Jason Powell's post on this issue; he gets to the heart of the matter much better than I do, and proposes an idea (that this issue, one hundred removed from the end of the original X-Men's run, marks the end of Claremont's exploration of traditional super-heroics) that goes a long way to explain why I enjoy the upcoming 40 or so issues so much, and while those same issues can equally be a turnoff to some. Carol apologizes to the X-Men for going berserk and causing explosive decompression. 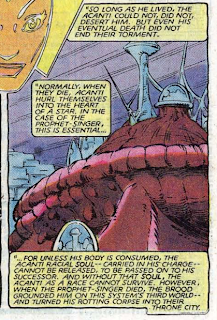 It is revealed that the body of the Acanti which forms the Brood's capital city, as seen in issue #162, was the spiritual leader of their race, the Prophet Singer. Wolverine is given a final opportunity to slay the X-Men before they transform into the Brood, but can't bring himself to do it, despite his fear that their upcoming transformation could jeopardize their mission. 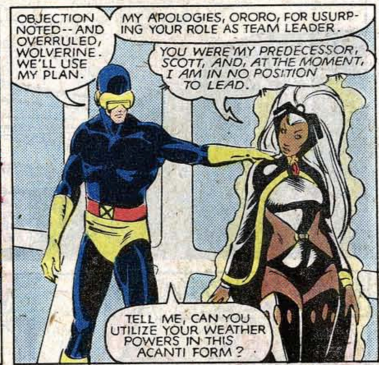 Cyclops apologizes to Storm for usurping her leadership position. 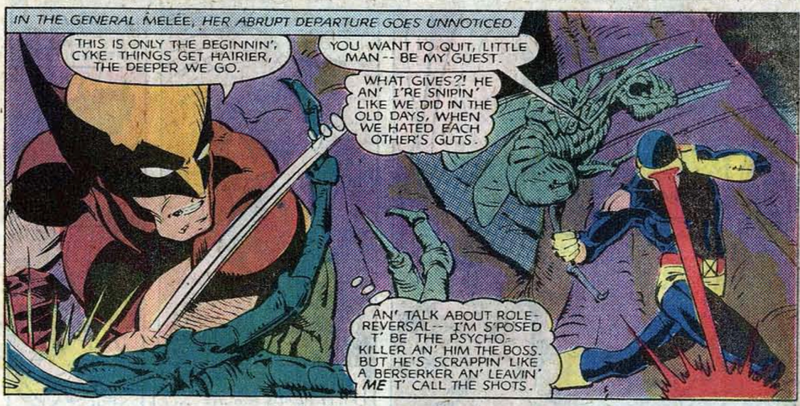 Later, Wolverine begins to suspect that Cyclops is transforming into a Brood when he realizes he and Cyclops are sniping at each other like they did in the old days. Cyclops expresses concern for the destruction of the Brood's planet. 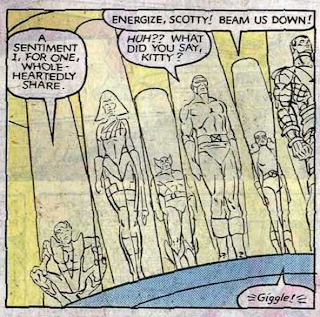 When teleporting down to the Brood throneworld, Kitty references Star Trek, to Scott's befuddlement. I like the little lightsaber dealy Lilandra wields throughout this issue. Colossus is "nigh-invulnerable" once again. Smith does a great job on Brood-ified Cyclops, and in the depiction of how that physical change affects his eye blast. Wolverine dives into one of Cyclops' optic blasts to free himself from his shackles, noting he turned at just the right moment to prevent himself from being turned into nothing but adamantium bones and pulp. 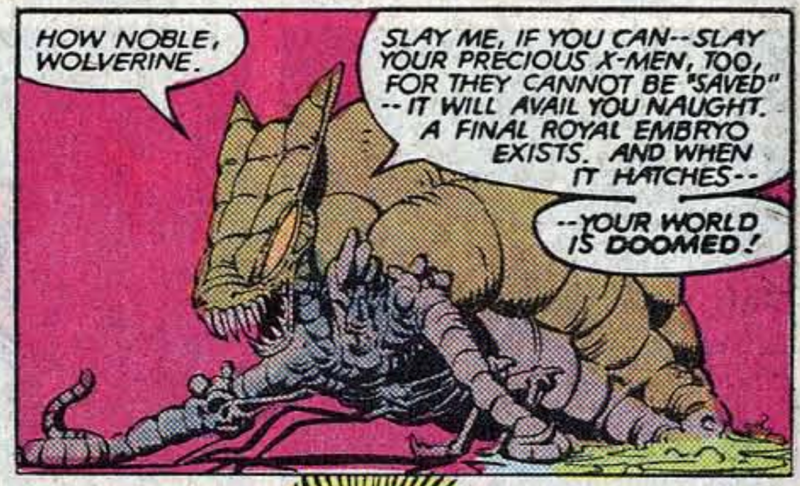 Later, Wolverine's fight with the Brood Queen leaves him requiring medical attention from Sikorsky. It looks like a Hostess ad, but it's actually for something called the "Magic Snake Puzzle." There's also an ad for Dark Crystal, a rare case of a definitive 80s movies of which I'm not a big fan. Though the story officially concludes next issue, this essentially marks the end of the X-Men's latest sojourn in space. 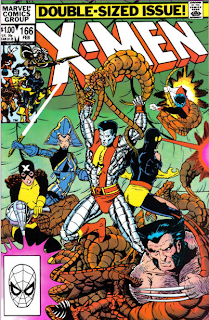 The undercurrent throughout this story has been the X-Men's stance on killing their enemies, with each character expressing an opinion on the matter and in some cases, altering it as their situation changed. Now, through Storm, Claremont re-contextualizes that debate, and offers a third objective: fight the Brood, maybe even kill them, but in the service of freeing an enslaved people rather than sheer vengeance. The Acanti are thus positioned, essentially, as a deus ex machina, but not just for the plot. They are a thematic deus ex machine of sorts, allowing the X-Men to once again act as superheroes. That's, well, at the very least, it's very interesting. However, most importantly, this last minute change of plans doesn't invalidate the previous moral quandaries through which the characters navigated. At the end of the day, their opinions, changed or otherwise, regarding whether the Brood deserve to be killed, remain the same. The characters have simply found a way to stay true to their overall mission: sacrifice, not in the name of vengeance, but in the name of freeing the oppressed. Right up to the very end, Claremont manages to never lose this thread, and it's what helps elevate this story (a bit over-long though it may be) above the previous Brood arc, as well as many other "X-Men in space" stories. At the end of the day, Claremont has, via a story involving alien bugs and space whales, crafted a treatise on the morality of superheroes. If this is, as Jason Powell asserts, Claremont's final, definitive statement on traditional superheroes, it's a strong one. Tomorrow, the New Mutants try to hold their own against the Brood-possessed Professor X in New Mutants #3. 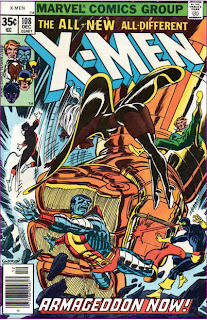 A week later, the X-Men finally return home in Uncanny X-Men #167. Perhaps the comic reads better. But, not having read this story, it sounds like it kind of went off the rails. 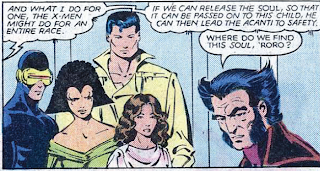 You mentioned it in your post, but the Acanti soul healing the X-Men does feel like a deus ex machina. And giving the X-Men a way to fight the Brood for more than just vengeance feels like copping out of their moral dilemma. At the same time, didn’t the readers know that a deus ex machina was in store for them? The whole story was about how the X-Men had Brood inside of them and knew they were going to die and the hopelessness associated with that but the reader had to know that ALL the X-Men weren’t going to die. And since the reader was given no information on how the X-Men could save themselves whatever did save the X-Men would have to come out of left field. 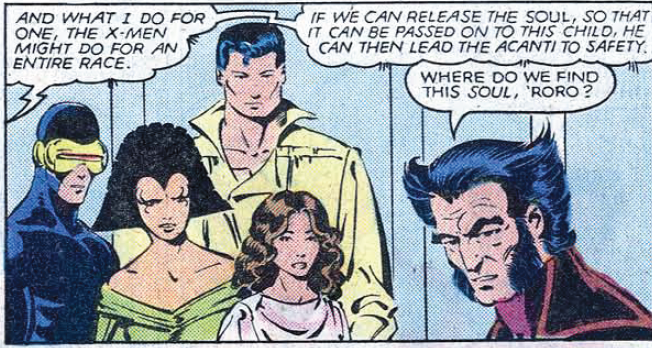 Maybe a better way to do it would be to have shown the Acanti soul earlier in the story and make it clear to the reader that it could save the X-Men but at the same time keep that information hidden from the X-Men so you could have the sense of hopelessness without the cure feeling random? I guess that would mitigate some of the tension of the story but I feel it would be worth it. Also, this seems like this is another case of snatching defeat from the jaws of victory. They defeat the Brood only to discover that Professor X has an egg inside him and Earth is threatened. It does read better (and my first draft of the plot synopsis was about two paragraphs longer, with some details that might have helped in that regard), but that doesn't change the fact that, at the root, a lot of what happened was pretty out there. But I don't think summarizing comic book stories, especially something like this, does it any favors. I mean, "Batman fights the Joker" doesn't sound as crazy as "Man dressed as a bat fights evil clown" even though that's what's happening. Reading the story helps mask some of the inherent ridiculousness in a way that is negated by summarizing it. That said, I wouldn't begrudge anyone who reads this issue and says "hogwash". I might disagree - I generally like this, batshit insane it may be - because I appreciate what Claremont is trying to do, and I have to believe he was well aware he was deploying a deus ex machina, but I totally get how someone else could read this and call shenanigans. And giving the X-Men a way to fight the Brood for more than just vengeance feels like copping out of their moral dilemma. A little bit, yeah. But in its way, it's almost as expected as the deus ex machina that removes the Brood eggs: you kinda knew Claremont wasn't going to turn the team into a group of Wolverines, so it was just a matter of finding a way to avoid it. He probably could have gotten some mileage out of having the X-Men kill the Brood out of vengeance AND get healed, forcing them to live with their actions, but I don't think he was prepared to monkey with the traditional superhero model that much yet, and at the end of the day, I imagine the idea of rewarding the X-Men for becoming killers wouldn't have sit right with him. I guess that would mitigate some of the tension of the story but I feel it would be worth it. It probably would have worked, and could have introduced a different kind of tension into the story (we see the X-Men struggling with their dilemma, Storm killing herself, etc. all the while we know there's a way out). It could be an interesting discussion about focus in superhero comics, putting the reader on the same level as the main characters versus giving the reader a certain level of omniscience independent of the characters. Also, this seems like this is another case of snatching defeat from the jaws of victory. The story gets a little too deep for me here, with the Prophet Singer, its newborn "soul", and Storm being bonded to an Acanti's consciousness. 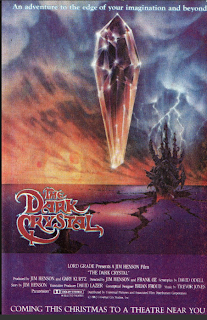 What started out as a sci-fi adventure story has suddenly taken on some weird and unexpected metaphysical themes. I think this is a large part of why I liked the first part of the Brood saga, with Deathbird and such, better. It was more straightforward. I've never liked that my favorite X-Man, Cyclops, is the first to be overtaken by his Brood egg, but unfortunately he's the only logical choice. He, Wolverine, and Kitty are the only X-Men who wear masks that could hide their transformation, and since Wolverine has no egg inside him and Kitty" is Claremont's Mary Sue, it pretty much had to be Cyclops. Also, looking at the various scans you posted, I have to say that Smith draws an outstanding unmasked Wolverine. Better than Cockrum by far, and -- dare I say it -- possibly even better than Byrne. "But fans who grew up with the character (like myself) tend to be more forgiving." Yeah, I'm in this boat too. Lockheed is a silly addition to the cast and he really does end once and for all any chance for Kitty to still be perceived as normal... but I can't not love the little guy! Also, he was so problematic that Claremont -- and most subsequent writers -- would just forget about him for months and months at a time. I think Lockheed was one of those things that Claremont latched onto in the heat of the moment. I believe Paul Smith has said that Claremont saw some random doodles he'd drawn of a little dragon, and immediately wanted it in the book. Same thing happened with Storm's mohawk, as we'll see soon (at least, I assume you have quotes on that topic -- it's been pretty widely discussed over the years). "...that goes a long way to explain why I enjoy the upcoming 40 or so issues so much, and while those same issues can equally be a turnoff to some." "Carol apologizes to the X-Men for going berserk and causing explosive decompression." That image is a great "model sheet" to show the characters sizes relative to one another. I miss how comically short Wolverine used to be. "Cyclops apologizes to Storm for usurping her leadership position." "Later, Wolverine begins to suspect that Cyclops is transforming into a Brood when he realizes he and Cyclops are sniping at each other like they did in the old days." I love that bit, because it really helps to cement the character development Wolverine has undergone over the past seven years. Though there is a part of me that will always miss the psycho-berserker Wovlerine that no one wanted around. "...noting he turned at just the right moment to prevent himself from being turned into nothing but adamantium bones and pulp." How far we've come. These days, Wolverine would shrug off a Cyclops optic blast like nothing. I doubt the healing factor would even come into play. Dr. Bitz -- "Maybe a better way to do it would be to have shown the Acanti soul earlier in the story..."
I really think Claremont changed his plans when Cockrum left. Cockrum was clearly a big part of the creative process while he was around. He didn't get co-plotter credit like Byrne did, but I believe he said in a quote Teebore used for one of the recent issues, that he and Claremont plotted the stories together. As soon as Cockrum leaves, we have the "quiet" issue while Claremont reassessea, then we move into this one, which wraps up the story with, as you both noted, some hot deus ex machina action. I suspect that if Cockrum had remained, the Brood saga might've had a very different ending. I still have replies to make on comments from #165! A long weekend visiting my dad was called for, however, so I'm moving on to my copious thoughts on #166 courtesy of the local library's Wi-Fi. If I ended up getting to read Teebore's writeup and the other comments, replies to those will follow, but time is tight; all of the following has been typed up on my unconnected laptop post unseen. You can totally see the changes made since Wiacek stopped embellishing Smith's pencils the way he had Cockrum's. (Smith's request to Wiacek, possibly through Louise Jones, was I think brought up last week.) I'd like to talk more about this kind of clean artwork another day. As tragic as it was to think of the Acanti being lobotomized, pierced by mechanical apparatus, and enslaved, knowing that the Brood are also eating them alive from within while "on board" is what revolts me the most. Cyclops: "[T]he rest of us beam down to the skeleton to make a run for the soul." Kitty: "Logan, I know what's happening inside me. I've never been so scared. But I'm not gonna give up. Maybe this is a hopeless fight, but I won't quit." "... I'm gonna live to do it with Peter one day!" Annnd Kitty switches to her new uniform between the last panel of Pg. 15 and the first of Pg. 16. Not to dump on Glynis Wein, as her work is usually stellar, but the red bands are colored yellow on Pg. 15 and there's no hint of the forehead X (maybe 'cause of the angle, maybe 'cause Smith or Wiacek just forgot) so, cover notwithstanding, all the new accoutrements come as a surprise on Pg. 16. For the record, I like the red bands; the X, not so much. Here's yet another reason why that Wolverine "solo" issue was a good idea. The planet, the Acanti soulsinger's husk on it, and the creatures who swarm around it have already been established. Nightcrawler: "Where do we go from here?" That line sure stuck in Joss Whedon's head. Sing it, Kurt! Wolverine: "Storm telepathically keyed me into the soul's 'scent'." "Now when we find it, Kitty'll phase through both me an' Cyke to add my natural healing factor to his eye-beams and that's how we beat the Z'nox." I feel like we should've seen more of the X-Men's battle against the Brood in the catacombs — or at least devoted one of the two-page spreads to that — especially since this was a double-sized issue. Binary is taken out by the Brood, after all that ink spilled in the service of telling us how she's one with the power of a freakin' twin-star system? When the Starjammer's ship appeared, I heard the Indiana Jones theme in my head — not Star Wars. I guess it's the swashbuckling. I know that Claremont is prone to the rhetorical flourish, but it's a little hard to swallow that the Acanti soul's entrapment on the Brood planet has lasted "untold aeons". Have the Brood really been around that long in their present state, making them highly advanced long before many other known species in the universe and by the other edge of the sword meaning that they have not evolved appreciably in all that time? It doesn't quite compute that no other race has proven a significant enough challenge to them in all that time yet that they haven't taken over untold galaxies in those "untold aeons" either. 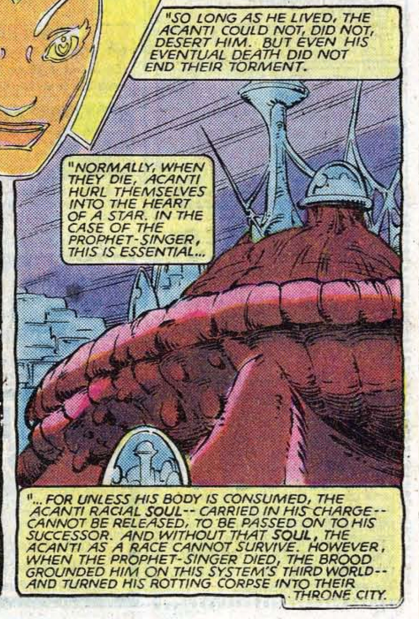 The Starjammers gave Carol a Star Trek communicator so that they could beam her up scot-free. What is Peter wearing in sickbay? Is that a V-neck sleeveless sweater over a short-sleeved shirt? It's a shame that the Prophetsinger couldn't fix Carol's Binary hairstyle for more than a couple of panels. Part 1 of a Special Two-Part Comment! A lot of "unpacking" (as the vernacular has it these days) going on here about a very brief sequence... I hope that if it's not your cup of tea, you'll at least be kind enough to roll your eyes with flair. There's a great set of panels at bottom Pg. 12 — viewable here. Not only do the panels get smaller, but both the tension between the characters and the quickening pace of the action is further suggested by the claustrophobia of the shrinking margins ("gutters") between the panels. The sequence begins pensively; by the time Wolverine pops his claws, the panel practically overlaps the next one with Kitty shouting, suggesting virtual simultaneity. Orz's lettering further underscores this — not that Smith's layout left him much of an alternative, so credit both of them — as our eye wants to go down from the words above Pn. 4 to Wolverine's arm but also sideways to Kitty's "No!!" attached to Pn. 5. We struggle to take them in as separate units just as the characters are struggling, until the panels are punctuated by the "Snikt!" of the claws back at the bottom of Pn. 4. This all happens unconsciously and at the speed of thought, minus the buffering our brains do when toggling between the competing visual avenues, but I'm convinced that it happens nonetheless. The way the lettering separates from the panels as the sequence progresses also, to me, heightens that claustrophobic feeling as well as the way the characters are separated amongst themselves out of mistrust and separated from the readers. 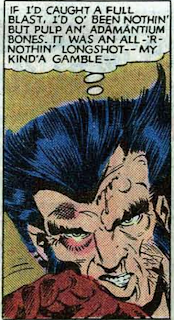 Wolverine's thought bubble is fully contained in Pn. 1, Cyclops' word balloon breaks the top of Pn. 2, Wolverine's internal monologue continues as quoted text hovering above / apart from Pns. 3 & 4, and Kitty's shout-burst hangs above Pn. 5 in tension with Pn. 4's sound effect and the claws that pierce it at the bottom. You'd think that the desired effort would be to draw us in. But I find that the way the characters are boxed in, their faces obscured, the panel borders shrinking progressively smaller, distances me — not in a way detrimental to the narrative, although the emotional result is negative; being put at arm's length from what is usually (or at least ideally) an intimate involvement with the storytelling is a very effective way of making me feel helpless during the showdown. Reading prose or comics is usually an immersive complicity, and here we're ever so slightly made observers instead of participants as the white space on the page, which we understand to be "outside" the action, becomes larger and more obvious. Part 2 of a Special Two-Part Comment! I'll admit that I have no idea how much of all this is intentional on the part of the creative team. Much of it could be happy accident. But I think that craftsmen with an innate understanding of the comics medium, be they veteran or (as in the case of Smith) young turk, are quite capable of exploiting its elements in such a pitch-perfect way consciously or otherwise. People talk about comics being more than just a variation on film in print and this sequence is a prime example why. Much is made of the reader's control over the reading experience in comics, i.e. lingering over the art or flipping back to earlier in the story, but the way smart creators try to influence that experience through mechanisms in panel-to-panel storytelling is is also virtually unique to the medium. The author(s) — here most definitely including the illustrators — are suggesting the tempo in a way that prose authors and filmmakers can't. The way our wires get crossed at the end of this dramatic sequence completes it perfectly. Once upon a time I think I would've been upset that the transition between Pn. 3 and Pn. 4 is a moment-to-moment transition with the "camera" held on the same object, Wolverine's hand, whereas every other transition in the sequence is a leap to a different discrete shot. Now, whether the product of sophisticated intent or simple freewheeling choice, I consider it crucially appropriate. I don't love the red background in Pn. 4, as it kind-of washes out Wolverine's first, but I'll give Glynis Oliver the benefit of the doubt and figure that, in addition to the rage / violence / bloodlust suggested by the red as Logan's claws extend, she's intentionally focusing our eyes on the claws and the "Snikt!" by making them (no pun intended) pop. The way the brown and red blend together produces a result similar to that of a photography lens focusing, which reminds me that I'd much rather have the effect accomplished this way than the actual blurring — to denote either speed or "lens focus" — through computer effects, rather common in comics today and not at all to my liking. 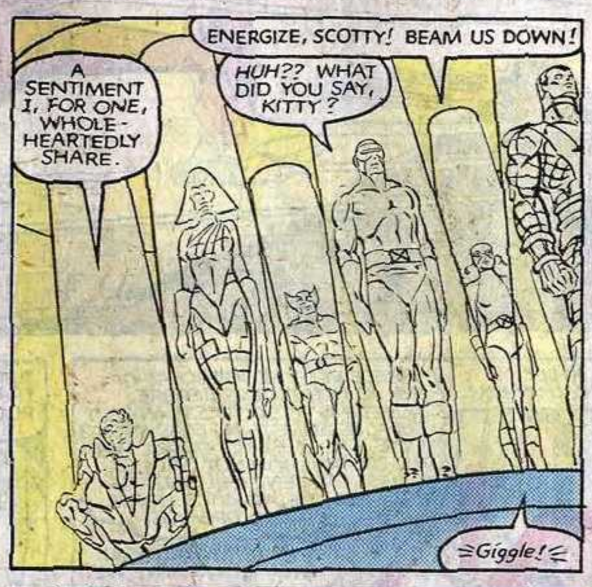 Maybe that's a lot to say about a five-panel sequence in an issue of X-Men, but you don't have to be studying Eisner, Kurtzman, or Krigstein to examine the medium. @Matt: I think this is a large part of why I liked the first part of the Brood saga, with Deathbird and such, better. It was more straightforward. Whereas for me, I liked the second part more due to the increased thematic complexity, though not necessarily the increased plot complexity, which does indeed get kinda loopy in this issue. I've never liked that my favorite X-Man, Cyclops, is the first to be overtaken by his Brood egg, but unfortunately he's the only logical choice. Ditto. And, rightly or wrongly, I've always chosen to read the reason why to be as you laid out, and not as any commentary on Claremont's part regarding the nature of the character (which also makes sense given his known affinity for Cyclops). I have to say that Smith draws an outstanding unmasked Wolverine. He does. He gives him a nice grizzled look that is very fitting. Yeah, he definitely comes and goes in subsequent stories. A recent story has suggested/revealed that Lockheed is an agent of SWORD (SHIELD's counterpart that deals with extraterrestrial threats). I haven't read that story, but I wonder if the reveal was meant, in part, to explain Lockheed's occasional absences? For that one, I have a link to an Comic Book Legend. Otherwise, I have woefully few quotes for the Smith run. The X-Men Companion interviews were conducted just as he was coming aboard, he wasn't interviewed for the Comic Creators book, and I haven't found much else online. These days, Wolverine would shrug off a Cyclops optic blast like nothing. I doubt the healing factor would even come into play. Exactly. I'm pretty sure during "Schism" he did shrug off an optic blast or two. I miss "not ridiculously-powerful healing factor" Wolverine even more than "comically short" Wolverine. I wonder if in that occasion the Brood egg was more concerned about stopping the attempt to free the soul, and was willing to sacrifice itself (and at least some of the other X-Men eggs) to that end? But I've always read it, rightly or wrongly, as Cyclops just being emotionally unstable, similar to his later sniping with Wolverine. I really like all the foreshadowing that issue does. Nice construction on Claremont's part. 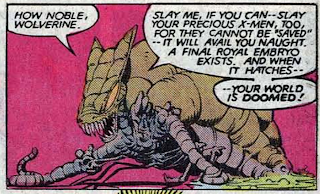 Yeah, I also should have made more clear in the plot summary that the X-Men spend a good chunk of this issue fighting not the Brood but the various creatures on their planet. It doesn't quite compute that no other race has proven a significant enough challenge to them in all that time yet that they haven't taken over untold galaxies in those "untold aeons" either. Reading prose or comics is usually an immersive complicity, and here we're ever so slightly made observers instead of participants as the white space on the page, which we understand to be "outside" the action, becomes larger and more obvious. Fantastic observation. This definitely is an immersive story - consider also the conversation between me and Dr. Bitz about how the readers learn about the unfolding situation at the same rate as the characters, and your analysis shows how the artists can counter that immersion for a few moments without blowing it away completely. but the way smart creators try to influence that experience through mechanisms in panel-to-panel storytelling is is also virtually unique to the medium. And that's one of the things I love most about comics, something I was never really able to articulate until I'd read Scott McCloud's Understanding Comics. Absolutely! Fantastic analysis all around. That's another great thing about comics - you can find great examples of the craft like that anywhere, in any story, not just in classic issues by legendary creators. Teebore -- "a! I guess I'd better raise the drawbridge and prepare the counterattack. :)"
To be honest, I doubt I'll have a lot of overly negative stuff to say when we get to the Romita and Silvestri issues. I have a like/dislike relationship with that stuff. It's around the time where Claremont's scripting really starts to wear on me, but I think his plotting is still strong, for the most part. 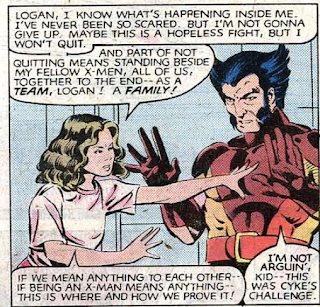 I just wish he was doing all this radical stuff with other characters, rather than the X-Men! Teebore -- "For that one, I have a link to an Comic Book Legend. Otherwise, I have woefully few quotes for the Smith run." Yeah, that was basically what I meant. I haven't seen much else about the Smith run other than stuff about Storm's mohawk. Storm and Binary are about to be overwhelmed when the Starjammers, having spent the last few weeks searching for the X-Men, drop out of warp. I'm reminded of something I just read recently (not, I think, for the first time) saying that coincidence is only allowed if it's detrimental to your protagonists. And this story is, to put it mildly, heavy on the coincidence. That doesn't mean I don't enjoy the story overall. I can't disagree with Dr. Bitz that there's a heap o' deus ex machination going on, but to an extent he answers his own question. All of the X-Men are infected; we know they're not all going to die, which probably means in this instance that none of them are. Despite what I paraphrased above about coincidence, however, I find myself much more forgiving of coincidence and last-minute reprieves and out-of-the-woodwork plot twists in pulpy serial fiction than I am in self-contained stories because they're part of the recipe. Claremont might've done well to hint a bit more at the potential of the "soul-chamber" to do what it did, and if he just didn't know how he was going to write himself out of the corner regarding the Brood implants then you can sure as shoot ding him (and the editor) for that. But unless done very deftly such a set-up could also have deflated any suspense there was about our heroes in peril. As I said in my first comment, I think it's all so crazy it just might work. The very nerve that Claremont has, the very fact we get so much out-there stuff thrown into the mix, renders the story almost impervious — nigh-invulnerable, you might say — to criticism that anything should be off the table, although the guy can make Alice of Wonderland fame look like a piker in terms her attempts to believe merely three impossible things before breakfast. Teebore seems to share my perspective and (mostly) defends the story admirably. I'm with you on Lockheed, too, Teebore (and Matt). Precious? Yeah — or, as Claremont would have it, "Yah." At least while Smith was there, however, within the vibe that the Claremont/Smith pairing brought to Kitty and to the series overall, it worked. VW: aftrate — Judge the back of a ship. Wolverine begins to suspect that Cyclops is transforming into a Brood when he realizes he and Cyclops are sniping at each other like they did in the old days. I liked this bit, understated at first. You can argue that having thought balloons driving home the fact sort-of tramples all over what had been relative subtlety, but it was probably also necessary to reward readers who'd been suspecting as much and clue in readers (often, probably, younger readers) who hadn't made the connection that the dynamic had poetically reverted to an earlier one and plotwise signaled the Brood's growing dominance over Cyclops' reasoning. I think that it's supposed to be less befuddlement about Star Trek than Cyclops' only half-hearing her and thinking she was talking to him because she said "Scotty". Which is at least an equally lame gag. So it does. 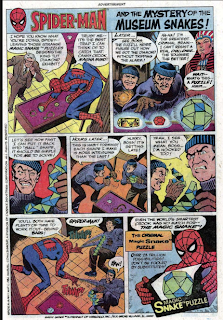 I realize that Spider-Man doesn't have a Riddler in his rogues' gallery, but it always confounded me when Hostess ads or those done in a similar vein used new, made-up, usually stupid villains instead of extant ones. I had a Magic Snake Puzzle, by the way — or something like it. The knockoffs of and variations on Rubik's Cube got hard to keep straight. All of this is very well put. @Matt: I just wish he was doing all this radical stuff with other characters, rather than the X-Men! I can get that. The really radical stuff (like post-Inferno, pre-Lee) I've never been a huge fan of, for a variety of reasons. 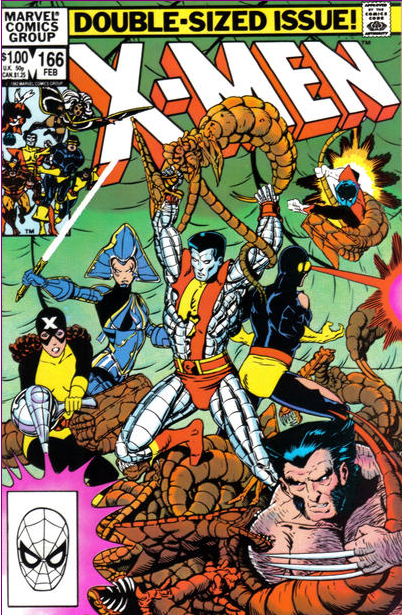 But I adore the Romita Jr. "just hanging with the X-Men, who happen to be superheros so they get into colorful fights" approach vs. the more traditionally formal sequential story arcs approach (as we discussed in #167's post) because it features the X-Men. I already like those characters, and that approach just allows me to get to know them better and feel like I'm hanging out with them. I don't think I'd enjoy that approach as much with different characters for whom I didn't have as much affection. @Blam: I'm reminded of something I just read recently ... saying that coincidence is only allowed if it's detrimental to your protagonists. I think Paul Smith does the best rendition of Wolverine's mask ever. I think that it's supposed to be less befuddlement about Star Trek than Cyclops' only half-hearing her and thinking she was talking to him because she said "Scotty". This tangentially related to the conversation at best, but you're right; I never noticed that before. A lot of his Rogues are roughly analogous to Batman villains, but he missed that one somehow. 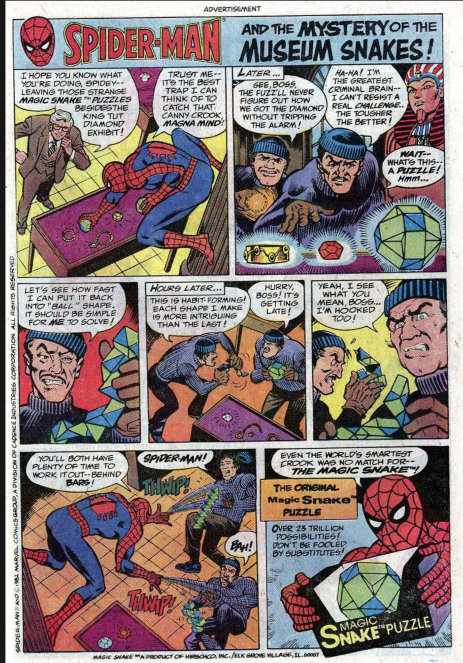 While it makes more sense for a detective character like Batman to have an intellectual/puzzle themed villain, I'm just surprised, given how Riddler is representative of a "type" of villain, that Spidey never landed a similar type. I liked it. As luck would have it, while this isn't what I was referring to, I just came across a variation on it at #19 in an infographic of Pixar's 22 Rules to Phenomenal Storytelling. Forgot to mention -- I agree with you guys that of all the "classic" regular X-Men artists, Paul Smith probably drew Wolverine's mask the best. I would put Byrne as a close second. At the other end of the spectrum, I think JR jr. and Alan Davis drew it the worst. I like Romita's art and I love Davis's (he's probably one of my top three comic artists of all time), but they both drew the pointy parts of the mask too short, stubby, and... fat, I guess? @Blam: I just came across a variation on it at #19 in an infographic of Pixar's 22 Rules to Phenomenal Storytelling. That's a fantastic link; thanks for sharing it. @Matt: they both drew the pointy parts of the mask too short, stubby, and... fat, I guess? Hmm, I remember their masks's being fatter but not noticeably shorter. I'll have to look at that again.